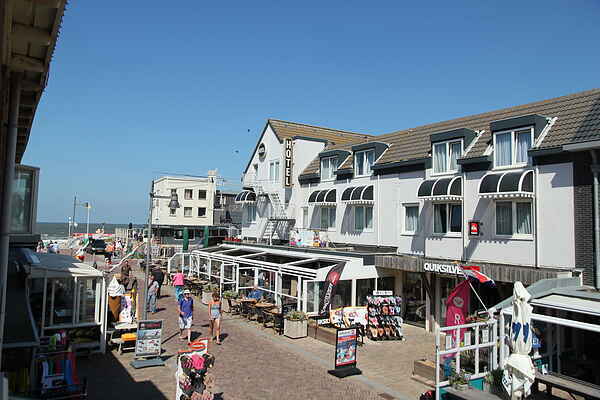 Located only 30 meters from the entrance to the beach and in the middle of the charming center of Egmond aan Zee, you will find this well-maintained apartment Egdmond Centre I for four people. It is situated on the first floor of a three-story complex. The many terraces and restaurants are within walking distance. You will have a spacious roof terrace with various sitting areas at your disposal. The large living area features a comfortable lounge and a kitchen-diner with a dining table large enough for everyone to gather around. The living room is also equipped with a TV and a DVD player. On the second floor, there is an apartment for four people, Egmond Centre II. The tenants of this apartment do not have a private terrace but may use your terrace. So it is very suited for two families travelling together. The sea is lovely in the summer and you can top up your tan on the beach. A day of culture? Then go to Alkmaar or Amsterdam, both wonderful Dutch cities. In Alkmaar there is a cheese market on Fridays, which is also great for kids. Guests can make use of the parking permit, which allows all day parking. The permit has an overview of all applicable parking zones. Note: Roof replacement will take place in week 46, this will take a few days between office hours (after Friday 4 pm no more work).